Mirja and her friends Sarah, Nina and Emmy never wanted to become a part of the society they grow up in. Their dream is to leave Sweden for Montevideo and a house at the beach where they could live as they want, without being judged. 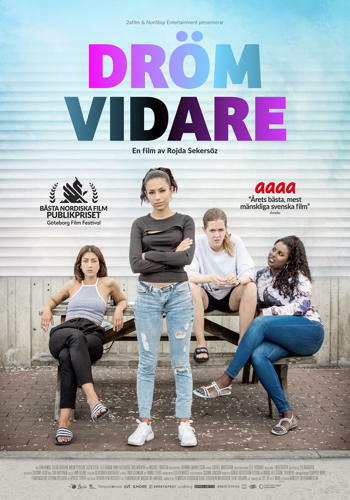 After serving her first ever prison sentence, for a failed robbery where she had been without the gang and their rules for the first time in her life, Mirja returns home and confronts new circumstances. She brutally finds out that her mother is seriously ill and very demanding. Mirja has to find a job – or be thrown out. In her ambition to handle the situation, Mirja begins to live a double life between the family and the gang. She needs to be a better daughter to her mother and an independent individual. But by becoming a part of the society, she must betray her friends and their dream. Mirja isn’t ready for the consequences that her new life brings. She tries to avoid conflict and friction as long as possible, but that’s easier said than done. Her fight to become an independent person turns out to be more difficult than she could have imagined. As soon as she feels independent from her past, the gang and her mother is there to drag her down again.